With the incredible drama this week with Milan management, this game had added attention and focus from the media. After such a horrible season to date, then going to Celtic Park and earning a win, Milanisti worldwide were looking to see if we could get two in a row. And for certain players, they will be always be seen as different, so they get a little extra “attention,” too. All in all, the club went into this game under the microscope. That's one way to silence the haters. It started out tough and scrappy, and that is how I would describe the first goal, too. Castro took the shot after a few other attempts, and it deflected off of our very own one goal wonder, Bonera. 1-0 Catania. So if the league decides to give the OG to Bonera, does he get to count that as a goal scored? Nah, he’s have a lot more goals if that were true. Poor Bonera. He is so awesome in the Champions League! Anyway, that was probably meant to be with our makeshift defense on the night, although Poli did pretty well. The teams traded chances, and Nocerino was a bit of a fireball. It seems he’s tired of sitting on the bench. He had several chances and showed a lot of grinta. 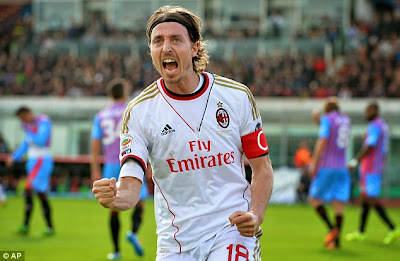 But it was Montolivo who would find the back of the net first for Milan, from a great cross in from Urby. 1-1. The rest of the half was a series of fouls, ugly tackles, saved shots, and oh, yeah, Gabriel getting slammed into by Maxi Lopez. But that was probably payback for Bonera sweeping Maxi just two minutes earlier, Bonera was lucky not to be booked for that one. Gabriel did well today, but showed his age and inexperience a bit. Still happy to have him as our 2nd keeper. In the second half, things started to open up. Despite having something ridiculous like 74% possession in the first half, and 71% overall by the end of the match, it seemed like we were missing plenty of chances. 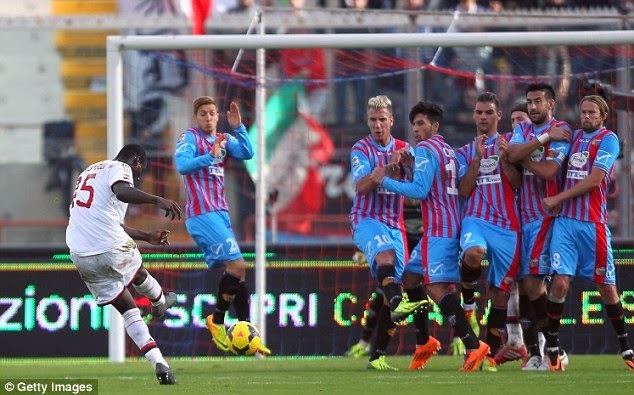 But Balotelli sent in a screamer of a free kick in the 63rd that nothing could stop. 2-1 Milan. On the negative side, a little while later, Spolli said something to Balotelli that Balotelli interpreted as racist. Kaka was able to get him to calm down, and Balotelli did approach an official to tell him, but it was a blight on what should have been a happy win. 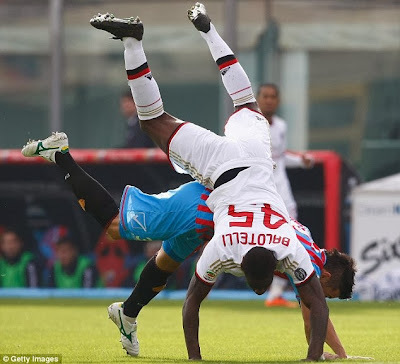 It also seemed to be the reason Allegri brought Matri on in the 83rd, “resting” Balotelli for the first time in my memory. Who knew Real Madrid's trash would be one of our greatest treasures? Another good thing about this match was that in the 74th, El Shaarawy returned from a long double-injury, replacing Birsa. 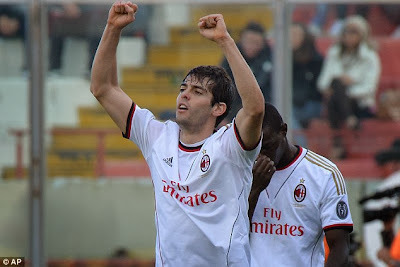 Then things got even better when, in the 81st, Kaka ran onto a forward ball and scored a nice one to make it 3-1 Milan. That was Kaka’s 99th goal for Milan, too. El Shaarawy’s guest appearance only made me more excited for his full return. Especially when Matri was receiving good balls in like he is meant to, and still couldn’t find the back of the net. But El Shaarawy and Kaka together looked pretty fun, even if Kaka played on the right once the youngster came on. Overall, Milan’s play was poor, like much of this season. But it was improved from most games. To have so much possession and not win more convincingly is disappointing. To be fair, we took 13 shots, with 7 on target, so accuracy was good this time, it’s just that Andujar is a decent keeper. Allegri still only used 2 subs, which was very disappointing. It’s hard to complain about injuries and not rest your players when you can. Although to be fair, he absolutely did the right thing to pull Balotelli off. Physical play is forgivable, Spolli... but racial insults are not. At this point, though, I’m not going to make too much of the quality or even of Allegri’s shortcomings. The supposed racial insults, however, really mar this win. There is no excuse for that kind of behavior., and it's not fair to put certain players under the microscope because of the color of their skin. But I am grateful for the three points. Away. For the second time this week. Grateful that our players are pulling themselves up by their bootstraps and finding a way to win, despite injuries and suspensions. I believe the quality of football will come if we can manage to keep winning. And maybe someday, we can just watch a match without them being under the microscope. Disclaimer: This post was written at 5:30am my time after no sleep. If it makes any sense, you’re welcome. If it doesn’t, blame Lega Serie A for scheduling a game at 3:30am my time. Stay tuned for an all new Milan Obsession Podcast tomorrow!